What better to protect your wounds than an author synonymous with the romance of the landed gentry? 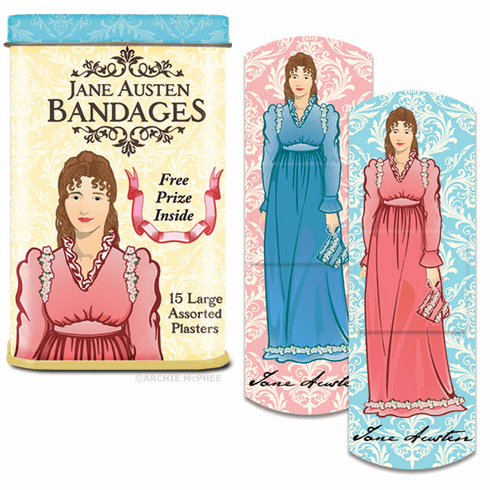 Each of the fifteen 3" x 1" (7.6 cm x 2.5 cm) plasters, thatÕs UK for bandages, comes in a 3-3/4" (9.5 cm) tall metal tin, and has one of 2 images of Jane Austen or one of 7 quotes from her best work. If the image of Jane Austen doesn't distract you from your pain, you also get a FREE temporary tattoo. Latex free adhesive.